Last week we had northerly winds with no rain; this week we have easterly winds with rain. A frontal boundary is working its way down the state while tropical moisture streams up along it from the Caribbean. Skies are clear to the north and birds were on the move last night. 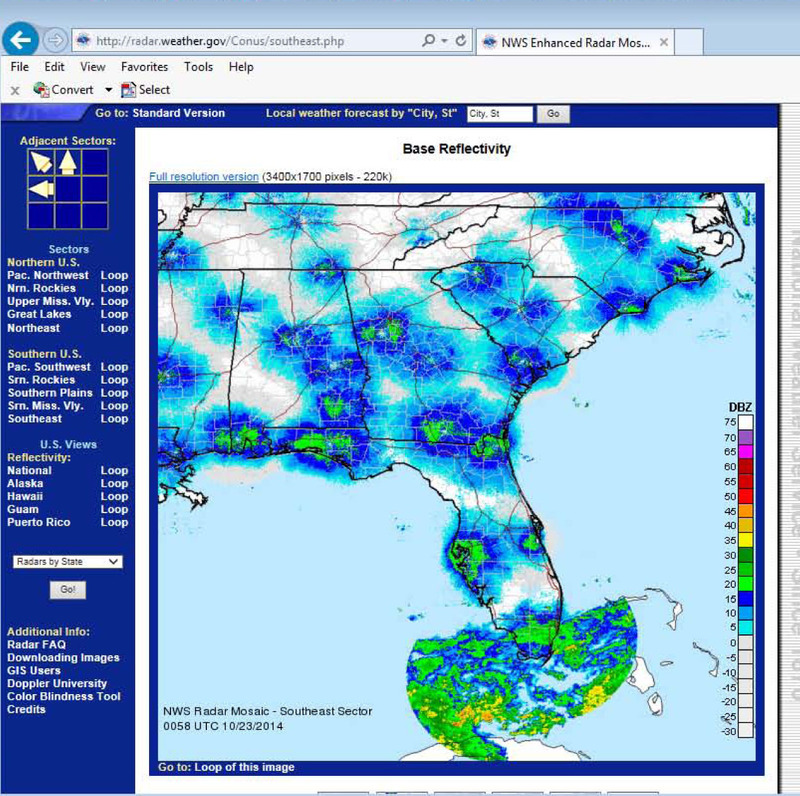 Below is the Doppler radar southeastern mosaic at 920 pm last night, showing the blue-green blobs that are migrating birds and the more sharply-defined green to yellow band of rain parked over southern Florida. Birds have a distinct look on radar when compared to rain, and David La Puma has a great primer on radar migration over on Woodcreeper.com. Some new species arrived in the last several days. Below is a yellow-breasted chat, the largest member of the warbler family, but its taxonomic status is in dispute. In many ways chats resemble tanagers or mimids rather than wood warblers. They skulk in heavy vegetation and can be hard to see in migration or during the winter when they can be found in brushy areas. Tennessee warblers have been present all week, but they are staying high in the fruiting ficus trees so we have only banded two of them. 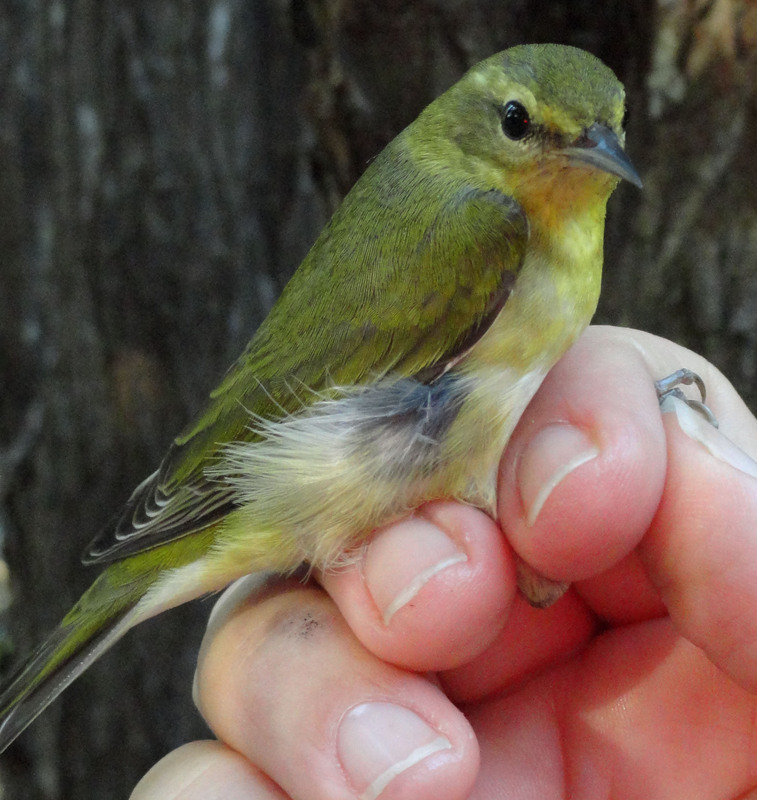 These small active birds have a sharp bill and the white undertail coverts separate them from the similar Orange-crowned warbler. 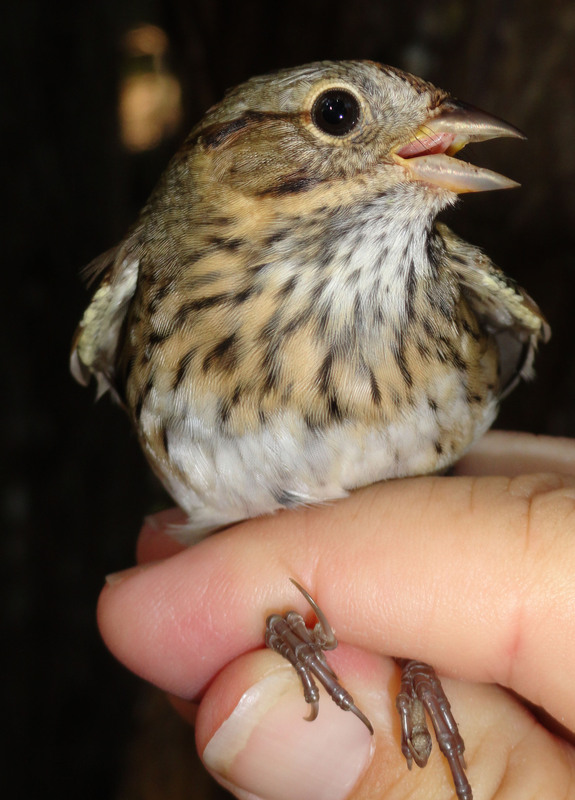 We don’t catch many sparrows at Cape Florida so this Lincoln’s sparrow was a treat! This species can be told from the similar (and much more abundant) Swamp sparrow by the streaks on the breast. Both these species are in the genus Melospiza along with the familiar (well, to anybody not living in extreme So Fla) Song sparrow. 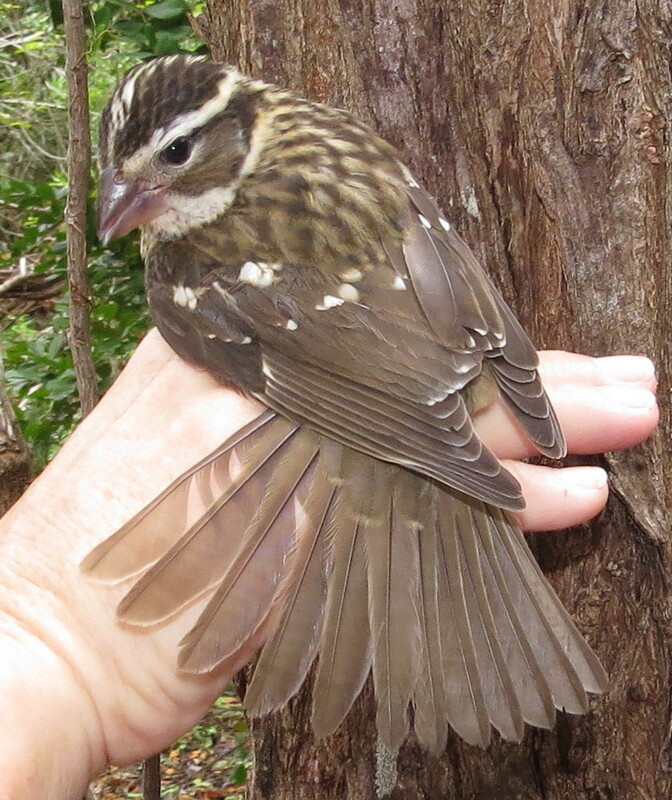 This bird below is a female Rose-breasted grosbeak; another species we only see one or two of in a season. The huge bill can give quite a bite when we handle them; worse than a cardinal in my opinion! Black-throated blue warblers are starting to come through in greater numbers since the second half of October is the peak of their migration. 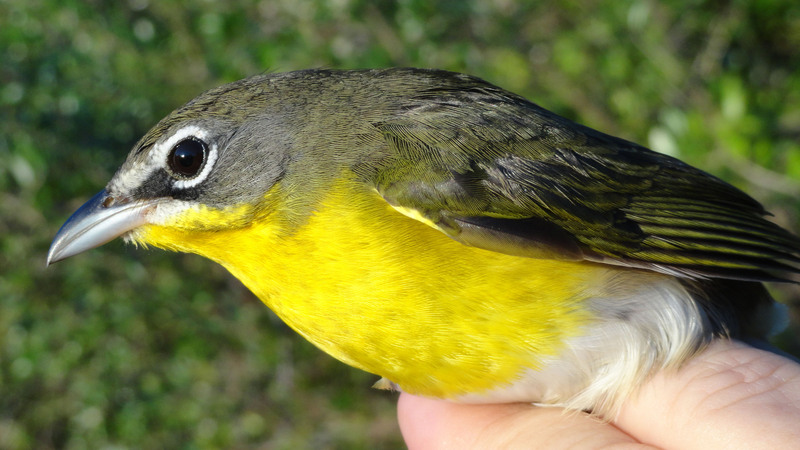 They are filling our nets while Tennessee, Bay-breasted and Magnolia warblers and Northern parulas stay up higher. Thrushes are still moving through, with four species banded in the last 3 days. Hawks and falcons are also on the move, and occasionally one will dive into the woods in search of a tasty catbird or other meal.